Some documents are long-lived and must be carefully controlled, particularly when they document your company's contractual obligations, or ISO certified policies and procedures. fileplan manages the lifecycle of every controlled document. Implement quality control – fileplan provides the toolbox for your Quality Assurance system. New versions start life as draft and proceed through set stages in a document life cycle. Once a controlled document is approved it can no longer be modified, ensuring the integrity of the document. 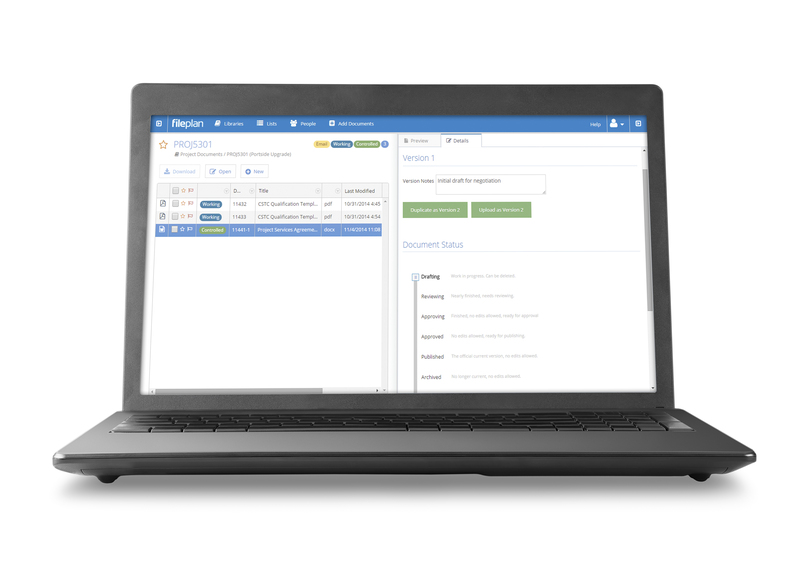 With a single click, convert any document or email to a controlled document providing life-cycle management and version control. Controlled documents can be regularly updated with no risk of confusion over which is latest version. You can easily and safely publish one version of a document while working on a private draft of the next version. Use Access Control to ensure Users and Guests see current published versions, while Authors can edit drafts and acccess archived versions. Easily save a document attached to an email as the next version of a controlled document. Great for documents amended by clients and contractors. Need to recover yesterday’s copy of document? fileplan keeps the last 30 saves of every document automatically. Every document and email stored in fileplan is allocated a unique number, the Doc ID. The ID can be easily shown on Office documents for traceability, even clearly identifying different versions of the same document.